I initially set out to write about the Motor Square Garden. I will write about it tomorrow, but first I am writing an overview of the East Liberty neighborhood to provide context. This context is needed to understand the neighborhood and some of the struggles in the city. The rebirth of East Liberty happening right now will be the center of rebirth for the entire area. Pittsburgh's East Liberty Neighborhood has a varied history, having gone from a top tier place to a tough place and to a neighborhood starting to upswing today. Early in the neighborhood's history, as the name "Liberty" in traditional English represents, it was the outskirts of the city. In Philadelphia you hear of the Northern Liberties section in the same sense of the name. East Liberty was primarily used for grazing animals and farming. The area was a fertile area for growing. A familiar name to Pittsburghers is Alexander Negley. A street named in his honor runs from East Liberty and through the Bloomfield/Friendship and Shadyside neighborhoods. In 1816 Negley had the foresight to have the Pittsburgh-Greensburg Turnpike run through the area. 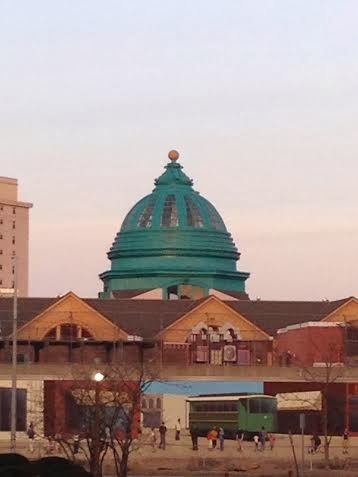 This made East Liberty a huge trading center. Later on, lawyer Thomas Mellon would marry Negley's daughter and East Liberty would thrive. The place further boomed as a trading center when wealthy industrialists would settle in nearby Point Breeze and Shadyside and shop in East Liberty. Mellon money would pour into the neighborhood and his influence would bring the streetcar routes through the neighborhood. East Liberty lies in the center of Point Breeze and Shadyside where the wealthy lived, Highland Park and Friendship where the professionals lived, and Bloomfield and Garfield that were primarily blue-collar neighborhoods. In the 1960s with big businesses moving to the suburbs, a plan was carried out to attempt to create more neighborhood automobile accessibility through creating a circle route named Penn Circle. The problem with creating this was that they needed to cut down a huge chunk of the existing buildings, creating a disjointed neighborhood in which pretty much all of the businesses ended up leaving. Additionally, during the "Urban Renewal" phase of the 1960s, a period which was devastating to the Black community of Pittsburgh, many Black families were forced to move from their traditional neighborhoods, especially the Lower Hill District in Pittsburgh, that was located at the former home of the Civic Arena. This area was known as the best Black cultural center neighborhood between Harlem and Chicago. Jazz legends like Louis Armstrong, Duke Ellington and others frequented this thriving community. The area was bolstered by the Great Migration, creating a booming and eclectic community. The Lower Hill District Neighborhood was the home of the legendary George Benson, arguably the greatest living jazz musician. He played the Ukulele and Guitar on the street and was discovered. He started as a child prodigy in the 50s, playing different venues and he was eventually discovered as a great talent by the record companies. The areas he frequented, the areas that helped him become a legendary musician, are all gone. The primarily Black families who lived in the thriving Lower Hill were all evicted from their homes by eminent domain with two days notice, uprooting families into migrant status. Pittsburgh Press August 16, 1958. "Exodus?" More like forced migration. What an awful chapter of history. The same situation occurred at both the Point in Pittsburgh and the failed Allegheny Center project in North Side. The thousands of Black families that were kicked out of their homes migrated to Homewood and this region became overcrowded. The next plan was to create tower housing projects in East Liberty. Anyone who is from a city or knows of the tower housing projects in the 1960s knows that these failed miserably. The same happened in East Liberty. The horror stories from folks that lived in these types of high rise housing projects are terrible. These problems led towards a further vacating of the neighborhood. The area is slowly recovering from all of these problems. The businesses are returning. A Target and Home Depot are located in the area with many other stores filling in from all borders. The future is looking bright. Lots of small and popular eateries are coming along with small businesses. Plans are in the works to create mixed income housing and the future looks bright for this neighborhood. The problems it has dealt with are devastating and I wish the best for the future. If they can once again help this area to boom it will benefit not only East Liberty, but all of the surrounding neighborhoods that could use a boost. In the 6 years that I have lived in Pittsburgh this neighborhood has steadily improved. If it continues at this clip, this fractured area should be fully booming once again as a great urban center. You can the spark with the reopening businesses, neighborhood improvement projects such as mural painting and the weekly farmers markets. This is turning into a vibrant neighborhood once again. I wrote quite a bit more about East Liberty than I wanted to, but this context needed to be set to fully understand the neighborhood and the difficult odds the Black community in Pittsburgh has faced. It is never easy to talk about racial problems but I feel this is something that needs to be fully addressed to help fix the biggest problem that Pittsburgh faces. Tomorrow I will write about what I originally set out to write about, Motor Square Gardens in East Liberty. The rebirth of East Liberty at this point will prove beneficial for all folks that live in and around East Liberty in creating steady employment in an area that really needs it. 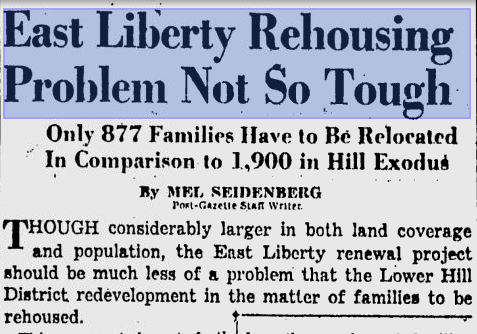 Here is a decent read from the Post-Gazette about some of the many problems East Liberty has dealt with over the years.